President Moon Jae-in left for Singapore Tuesday for annual summits with Southeast Asian nations and their dialogue partners as he strives to bolster relations with the region and drum up international support for his initiative for peace with North Korea. 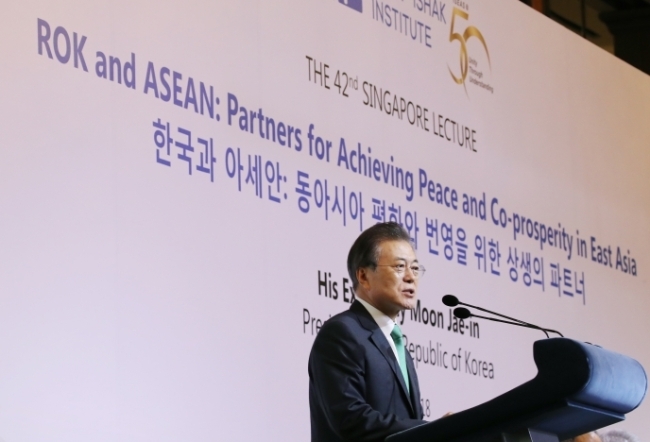 During the three-day visit, Moon is scheduled to attend a trio of annual summits hosted by the Association of Southeast Asian Nations -- a Korea-ASEAN summit, an ASEAN Plus Three summit also involving China and Japan and the broader East Asia Summit. Presidential officials said Moon plans to propose holding a special Korea-ASEAN summit next year to further solidify relations with the Southeast Asian nations under his "new southward policy." Singapore is the first leg of Moon's six-day trip that will also take him to Papua New Guinea on Saturday and Sunday for this year's summit of the Asia Pacific Economic Cooperation forum involving Pacific Rim nations.